Most of the people even take that, working as a receptionist of a company or an organization can be comfortable at its best. But unfortunately people taking the job description of the receptionist are taken granted. So let’s be quick and brief, a receptionist or a front desk officer or an administrative officer is a person who is appointed to greet all the company visitors and to attend people on telephonic conversation. So when hiring receptionist one should look at some qualities and traits in the candidate. A receptionist is a person who takes responsibilities of being a face of the company who is easily available to all the visitors and also who can attend their doubts and questions regarding their company affairs and working environment. Working as receptionist of the company provides a huge responsibility of handling all the updated and necessary details about the company. Moreover, a receptionist need to handle visitors in person and of course through telephonic conversations as well. Most of the time while hiring receptionist, the employer keeps in mind that the candidate finalized should be of a pleasant personality and nature. It is one of the must qualities of a receptionist. Moreover, the employer expects their company receptionist to be of a pleasant personality so that the receptionist can be welcoming their visitors with a positive approach and treat them well in the company. It is a common thing that people expect from others that they need to deliver positivity to others regardless of any reasons. Similarly, the company expects their employees specially the one who is working as a receptionist of the company. It is a sole duty of a receptionist that she or he needs to handle and deliver his or her best and positive behavior in front of the people who come to visit their company and also handle all the duties over the phone as well. It is one of the main responsibility of the receptionist or a front desk officer that he or she needs to welcome their visitors positively. And treat them well with utmost gratitude and respect. Moreover, the work related activities of the receptionist includes that he or she needs to treat all the visitors well who enter the premises of the company. And try to make them comfortable with the offerings that the company provides for their visitors. It is the most common responsibility that every receptionist needs to handle. Attending calls and providing all the necessary details to their callers regarding the company related issues is one of the duties of a receptionist. Moreover, these receptionists need to update their company affairs to their superiors over telephones. Therefore, the working environment of these receptionists handles all the activities of the company. Security measures that are maintained in the company or an organization such as scheduling meetings confirmations, monitoring register books and issuing coupons to the visitors. The work of receptionist needs to be handled with such level of responsibility that anyone who is unrelated to the company or an organization should not be allowed to enter the office premises. Therefore, a receptionist need to handle all the security measures and maintain all the register book precisely so that there won’t be any issues in the future. The employees register is a log book in which all the attendance details about the employees will be entered and registered for the company purpose. The receptionist need to be aware while handling those types of company register because if there happens to be any issues and conflict between the employees of the company regarding any personal and professional reasons, then the company needs to have some proof of their work in the form of a register book. A receptionist need to check for the company related postages which are required in the office immediately, and later on hand over those postages to the relevant officers of the company. Therefore, it is very much necessary for the receptionists that they need to handle all the postages related to the company on their track of work so that there won’t be any confusion because of any kind of mis-communication. As visitors enter the company premises and directly lead them towards the reception desk, and inquire all the necessary details from the receptionist. And that is why the company expects their receptionist to handle the clean and precise measures to maintain clean and precise reputation of the company. Moreover, the reception desk is the face of the company and everyone walks to the reception desk first, then they judge about the company well being after that. As most of the people are familiar with the working environment of the receptionist, then it is quite easy to understand that the receptionist should know the importance of the company documents. It is the sole responsibility of the receptionist that if there any documents which needs to be delivered to the superior of the company, then the receptionist should take responsibility of those documents and deliver it the superior officer. In the bucket list of the most common duties & responsibilities of receptionist, receiving messages and updating meeting confirmation would be the important one. Because most of the time outsiders are allowed to contact the reception desk first instead of their superior officers. And that is why the receptionist need to take care of such meeting confirmation calls and timely inform the superior officers about it. Therefore, as a common factor which is familiar with everybody the receptionist need to be quick with their work. As the reception desk is the entrance of the company, similarly receptionist needs to be the front face of the company. And that is why to handle the face of the company the receptionist should acquire great personality and looks. It is not necessary that every company looks for the receptionist who is pretty, but there is a fact about the receptionist selection that, while selecting the receptionist needs to have a great personality so that she can handle their clients well and keep them busy. It is a must quality that every employer expects from their receptionist. Effective communication levels helps a receptionist handle all sorts of peoples and visitors of the company. The receptionist with an excellent and effective communication level can handle telephonic conversations and also it is quite easy for them to maintain healthy relationship with their directors and the company employees. One of the essential attribute and the quality that needs to be available in the reception is that the receptionist should be way more professional while handling company affairs. The company affairs in the sense all the outdoor activities of the company such as handling visitors, confirming mails and receiving new clients and many more. Therefore, it is necessary to handle these activities with the utmost level of dignity and professionalism which is possible only by a great receptionist. While working as a receptionist at the company or an organization the person handling that position need to be well versed with their multitasking capabilities. Being a multi taker is not that easy thing to do. A multi tasker handles more than one task at a same time and handling it perfectly without affecting any of the tasks. Therefore, a receptionist working in the company needs to be a multi tasker because they are the one’s who handle official duties and telephonic conversations simultaneously. A person working as a receptionist in a company need to be technically sound. It is a second most ability that should be mastered by a receptionist after their effective communication skills. Technical skills can be measured in terms of their abilities to handle mechanical items such as computers, printers and fax machines. Therefore, obtaining technical skills is mentioned as one of the must for all the receptionist who wants to be great in their position. As most of the people think that working as a receptionist can be easy to handle, but the actual work and activities that these people who work as a receptionist undergo through is comparatively tougher than any other job. Moreover, to handle such level of excellence in their work a person need to be great with their organizational abilities which helps them handle all sorts of organizational issues. It is one of the qualities that every person working as a front desk officer or a receptionist must posses. Most importantly, when a person with their interpersonal skills handles a situation, then it is quite possible that they communicate that particular issues better than anyone else. Therefore, it is very much necessary to understand that a receptionist person must have a better interpersonal skills to be great in their part of the work. Most of the time when a person has a quality such as better listening skills, then for them everything which is going around gets easier. And that is why being a multi tasking expert, a receptionist must be good at their listening skills so that while working on more than one task, the receptionist must be clear with their task and the order they received to complete the task from their superiors. Therefore, good listening skills are always going to favor a receptionist in all means of their work. 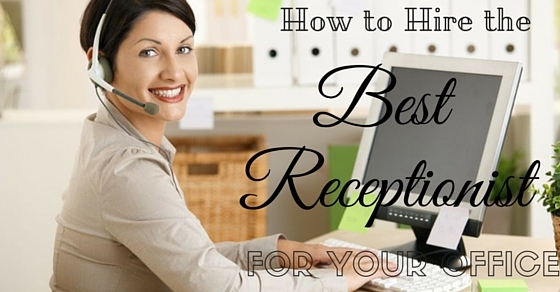 It is very important for a receptionist that she or he needs to be at their desk all the time. And that is because any calls or any visitor comes from the office desk, then should it be attended with a receptionist so that there won’t be any sort of loss to the company. Similarly, whenever someone calls to receptionist desk, then receptionist should be there attending such calls. Therefore, it is one of the qualities that every receptionist must have while working in the company. Most commonly a receptionist needs to be quick with their working order. Sometimes it is possible that a person might visit the company and unfortunately the receptionist is not aware of the thing that the visitor is asking about, then at that time the receptionist should be quick with their thinking ability and handle that person smartly so that the final impression of the company on that person should be positive, while exiting from the office. Finally, the bottom line is that, hiring the best receptionist for the company, can definitely provide enough knowledge about the duties and responsibilities of receptionist. Moreover, this discussion will deliver those open qualities of the receptionist which every company must consider while hiring receptionist or a front desk officer for their company. Therefore, if there is anyone who is interested in knowing more about the work and routines of receptionists work, then they can follow all the above mentioned factors.